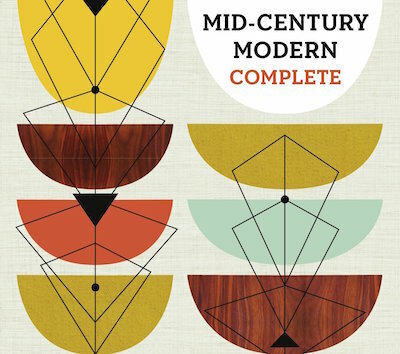 Mid-Century Modern Complete, by Dominic Bradbury, is a survey of design in the post-war era. The book, published by Thames & Hudson, follows the same format as Alastair Duncan's Art Deco Complete: profiles of the major designers in each medium (including Charles and Ray Eames, Dieter Rams, and Alec Issigonis), and an alphabetical guide to other designers and manufacturers. The book includes concise essays on mid-century glassware (Glass Design, by Joy McCall), ceramics (Mid-Century Ceramics, by Alun Graves), textiles (Artist-Designed Textiles, by Sue Pritchard), industrial design (From Computers To Corporate Identity, by Jana Scholze) and, especially, graphics (Mid-Century Confluences, by Steven Heller). There are also more than 1,000 colour illustrations, including many full-page plates. The Mid-Century Modern style was first described by Cara Greenberg in Mid-Century Modern: Furniture Of The 1950s (1984; not listed in Bradbury's bibliography). Greenberg's book focused on furniture and interior design from 1947 to 1957, though Bradbury covers furniture, interiors, lighting, glass, ceramics, textiles, products, and graphics from the mid 1940s to the late 1960s. As Bradbury writes in his introduction, the period he surveys "was an age of ages - the atomic age, the space age, the jet age, the computer age". Inevitably, this is beyond the scope of a single book, even one with more than 500 pages, and some areas receive more attention than others. There are profiles of individual designers, though no general overviews of trends in furniture or interior design. While American and European designers are well represented, Japanese design (such as Sony's transistor radios and televisions) is largely excluded. The post-war period, especially in America, was an era of consumerism, with the rise of branding, fast food, and international popular culture. Bradbury describes it as "a sustained era of golden growth that spurred demand for a whole new spectrum of goods, products and services, which the world of design was happy to provide." Post-1945 design has also been covered by other books, including Modern Furniture Classics (Charlotte and Peter Fiell, 1991), Cold War Modern (David Crowley and Jane Pavitt, 2010), and The Art Of Things (Dominique Forest, 2014). The forthcoming third volume of Victor Margolin's World History Of Design will also cover post-war design.